The S.C. Department of Natural Resources (DNR) and The National Wild Turkey Federation are offering a great opportunity for aspiring young hunters of South Carolina to attend a free wing shooting clinic Aug. 12 from 8:30 a.m. until 1 p.m. in Edgefield County. 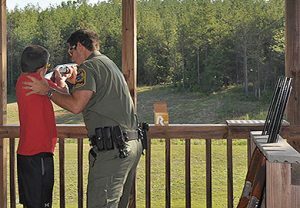 Participants with wing shooting skill levels from beginner to advanced learn how to safely handle and shoot a shotgun. The clinic will introduce all the basic wing shooting skills needed for a successful hunt. Target presentations resemble actual field hunting situations. Youth in attendance will have the opportunity to clean, cook, and most importantly sample quail they have prepared. The local game warden will go over basic laws and safety while in the field. We will also have on hand some of the latest gear for bird hunting. There is no charge for the clinic and lunch will be provided. DNR welcomes parents and guardians to stay while their students participate. To register for the clinic youth must be at least 10 years of age and complete a clinic application. If you would like more information or an application to attend, please contact FSgt. Steve Simpson at Simpsons@dnr.sc.gov or (803)609-6807.